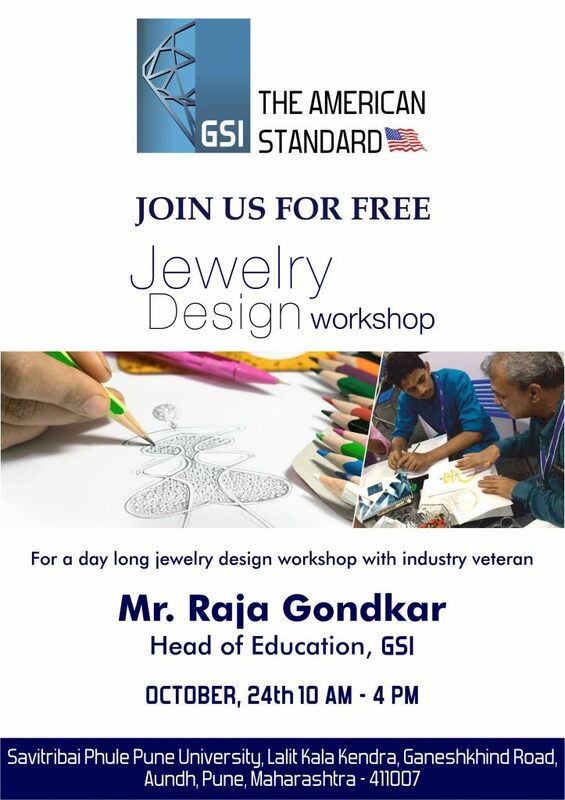 GSI’s is sponsoring a free jewelry design workshop presented by Raja Gondkar. Education Head GSI. Gemological Science International is a leading gemological body that provides reliable gemstone identification and grading services. At this workshop, Mr. Raj Gondkar, Education Head GSI (B.F.A) Applied, will help explore students’ innate creativity and how one can sketch and define various designs. GSI’s objective to move around cities and conduct design workshop is to help students all across India to develop this innate skill. The workshop will be held on 24th October at Pune University, Maharashtra at 10 AM— 4 PM. This workshop is open to university students and it will be carried by a one-hour presentation, followed by Q and A, and giving away several handouts of the exercises book. This workshop is part of the continuing student’s outreach and partnership of GSI with city universities to promote Jewelry Design as a career option as they can work to bring better understanding, acceptance, and inclusion of those on the spectrum with industry professionals.